I got a package from Ro! What a total sweetheart. She went to a lot of trouble to send us this certain special tea from the Huntington. Love her so much. It’s the best smelling tea ever. If it wasn’t meant for consumption, I’d scatter it about my house as potpourri. We’re sending a few tins to our parents because both sets seem to love it too. Jeremy brewed a pot tonight and now I’m wired beyond belief. If only blogs were scratch-n-sniff. 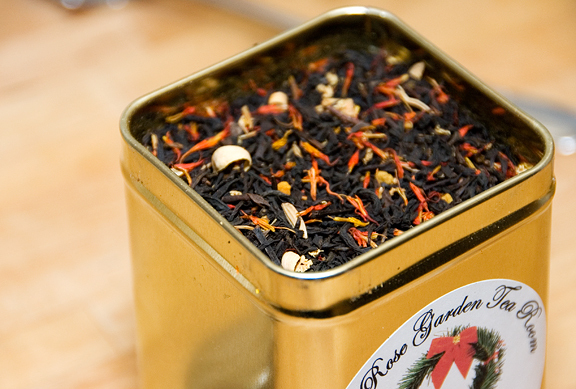 This smells of peach and passion fruit, but is a lovely black tea with orange blossom and other dreamy ingredients. I wish I could give everyone a tin of this tea. If you live in Pasadena – run now to the Huntington! They only carry it in the rose garden tea room this month.